Øyvind Teig: 019 - Play (with) network-disk based iTunes library? This post is a follow-up from my post 018 - From concrete CDs to abstract iTunes files. And now the old amp broke. Things have now become somewhat clearer for me. I now seem to know the questions - and some answers! July 2012: I have added Apple TV and thrown out JackOSX because it did not seem stable on Lion. (I am not able to update the old Mini to Mountain Lion.) So, the figure above is not updated, but see a new and simpler figure at note 027 "Experiencing Apple AirPlay" - and some points about Apple TV. Now, all iTunes files are located on a network disk and the Media center (Mac Mini) is running the iTunes as Master while the other machines run iTunes as Slaves. I have dropped the pseudo multiclient architecture described in 003 - Shared iTunes library on a network disk when iTunes went on to version 10.x but iTunes on Tiger machines now have stopped at version 9.x (Sept. 2010). There is a small description of the new architecture in the blog 003 ref above (blue text there). The stereo now is a Denon Ceol RCDN-7 with AirPlay, new June 2011. See blog 027 Experiencing Apple AirPlay. I also see the Apple's plug-in solution with the Remote app works like a dream! The whole library in the hand, with music graphics and all I sure have learned since I, half a year ago, deemed that solution as not practical! But I had to (or have to?) quarrel with firmware updates to get there! See 004.5 and 004.6. In Nov. 2011 I gave up on Airport Extreme with a USB connected NAS disk for an Apple Time Capsule with internal disk instead. See 004 - Living with a network disk in the house. The goal is to be able to play our music (and view the CD covers) on all the units above: the Media center, the Laptop and Desktop, the Stereo and the Portable (sitting permanently on the fridge). The existing local net should be used as much as possible. There should be as little direct cabling as possible, like analogue, USB or FireWire or opto-coupled TOSLINK (S/PDIF). Also, the Stereo should be controllable from the Media center and Laptop. And the Stereo should be able to stream "sound out" from those two units, meaning that we could have better sound while viewing TV or running iTunes on the Laptop - since they are all in the same room. The users would be me and my wife. Children are satisfied with the the wifi when they are visiting. And grandchildren are satisfied with what we are satisfied with, for now. If wishes coincide, then one of us must at best yield to earphones, since the iTunes files are readable from several sources, but the iTunes client is not multiclient. However, radio, internet radio, TV, DVD or a book would be acceptable alternatives, as well as the basement shop - or a good walk. Please observe that a "5.1 home cinema system" or a "wireless multiroom music system" is not what we're after! However, we might end up using a component from one of these. TV sound: is terrible as with most LCD tvs, and a pair of Logitech active PC speakers with subwoofer unit are still small enough and good enough for a tenfold enhancement by all measures. But the Stereo is much better, but too old these days. When I want to play music in iTunes on the Laptop and want some more power, I use a cable from it to the existing Stereo's line input. Surprisingly there is no audible hum. But for a new Stereo I'd need a better solution! There is no way at the moment to play TV sound on the Stereo. Wiring it is no viable alternative. Streaming of "my?" music with a Spotify client I seldom do. If all I needed resided "in the cloud", some problems would go and some come - and some stay. The architecture I describe already streams a lot, internally and externally - like internet radio stations. So, when iTunes comes with streaming services, so be it! I would still not delete the music library on the network disk, and still wonder if I ever find time to import all the legacy 33 rpm record albums. No, I have no plan to switch to Windows, Windows Media Player or Winamp. I know they're good and that people are satisfied with them. Fine! It supports Mac OS X "Core Audio" (ref), which I learned about in note 018. It references http://www.jackosx.com/ "Jack OS X - a Jack audio connection kit implementation for Mac OS X. Connecting audio from any OS X application to any OS X application"
I also sent a letter to one of the JackOSX authors, who forwarded it to the Yahoo! jackosx group. See http://tech.groups.yahoo.com/group/jackosx/message/3109. I am now (again) registered as aclassifier there. I certainly hope there will be lots of help! I also am aclassifier at Sonos. I have now dowloaded JackOSX onto the Media center (Mini). Setting up routing with the JackOSX Connection Manager is nice but has to be learned: push one end and then double-click the other end to connect. And stereo means connection '1' and '2' for "left" and "right"
TV and iTunes could sound simultaneously. It's not enough to switch. One has to turn something on and something off. However, switching the Screen to the Media center disconnects the TV sound, since it comes through the HDMI to the "TV"
Another thing: it's possible to run this sw invisibly. Stopping the JackPilot stops the Connection manager and the Pilot window but not the JackOSX server. Nice! I am looking at the Yazsoft media server http://yazsoft.com (which probably reads CoreAudio from JackOSX server?) and exports UPnP data streams..
..which may be read by a Stereo, being an Arcom Solo unit, see http://www.arcam.co.uk/products,solo,Music-Systems.htm. The Sonos ZonePlayer ZP120 I cannot see is able to read UPnP datastreams? The best of the two worlds would be to find something that sees the network disk iTunes library and UPnP datastreams? Ok, maybe? Entering a url to a datastream plays that datastream. Starting an Apache server is a matter of ticking in a dialogue box. But then, that's not all I want. Update July 2012: I added an Apple TV unit. See my new note 027 "Experiencing Apple AirPlay". Apple has already had the AirTunes streaming protocol some time, somewhat discussed in my previous note. I discarded it as pretty uninteresting there. However, the follow-up protocol AirPlay, introduced by Steve Jobs in Sept. 2010, looks more promising. (Maybe he saw the despair in the notes..). Apple informs about AirPlay at their page. There's also a wiki-page, of course. Read those now. A company called Frontier Silicon develops solutions for modern radios, like the Pinell Supersound II (blog 18). I would be surprised not to see AirPlay appear from those sources. Not many (any?) present systems will support AirPlay, so I'll have to wait to see it included. It might be worth it. As one of the major vendors answered my question in a closed User group: "Will nn support AirPlay in any of your products?" with the reply "We don't know yet.. with our current line of products it's not possible." Please see fig.1 and the following (above). So, why do I think this is for me? Before I answer, I have a general worry here. See "Rogue Amoeba's Airfoil" (below). It routes AirPlay sound. However, it needs to insert a delay in the sound so that it can be heard in phase on all AirPlay units across the home wired or wireless network. In other words, the tv should also have delayed the video, like Rogue Amoeba's built-in Airfoil Video Player. So, in order to distribute tv, I would have to wait for a tv with builr in AirPlay? So, my general wish to have one audio routing sw only may not be easy to get for a while? I can play iTunes on any machine and treat my new Stereo (with AirPlay!?) as an external speaker, just like with Airport Express. Nice! It would work over WiFi and Ethernet. So, the Portable (with AirPlay) could equally be an external speaker! I would be able to stream also from iPhone to any of these units! And what would I certainly hope for? I would certainly hope that the AirPlay sources would be available under macosforge. That way, any programmer like myself or the JacOSX people could get it going as well! Update: forget it! This most probably needs an AitPlay chip to run. Interesting reading is "Forget Apple TV. AirPlay Is Apple's Sneak Attack On Television" at Gizmodo which tells that there's a hw chip needed(?) 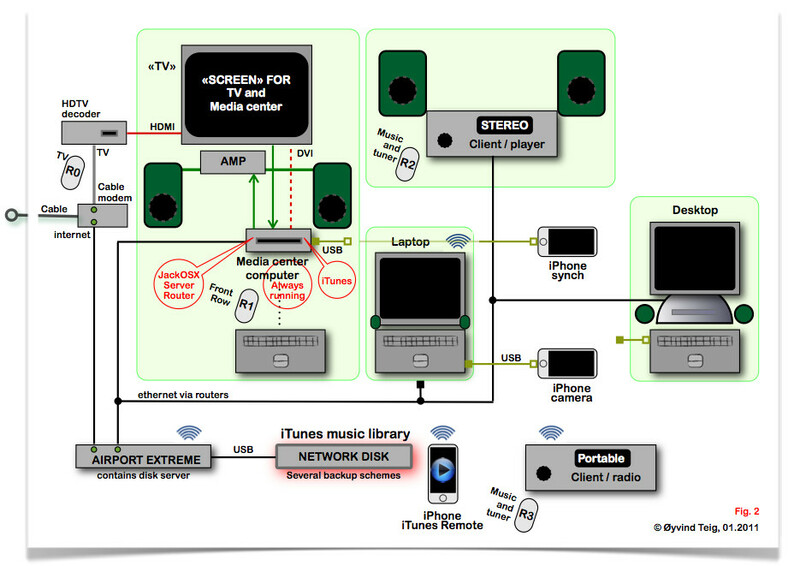 for AirPlay - and asks if it will coexist with UPnP, DNLA, and Windows 7 streaming. That article points to this BridgeCo blog. Read on! Conclusion: since I must also run the JackRouter, I don't need Airfoil before we also buy AirPlay hw. And then I would need to run both JackRouter (for tv) and Airfoil (for sound only or video played with the built-in Airfoil Video Player). However, "Airfoil recognizes only AirPlay (formerly AirTunes) devices" (reply to support mail). Therefore Airfoil sw will not see or be seen by Sonos devices, since Sonos doesn't support AirPlay with their present range of hw (as of late 2010). Rogue Amoeba does not have any white paper to describe Airplay's sw architecture. "As for a white paper, no, sorry" (reply to support mail).